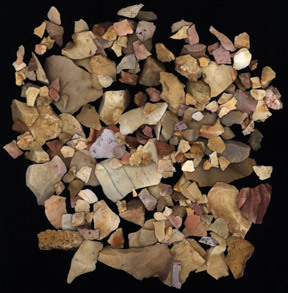 Stone tools and other lithics, including cores, bifaces, and flakes, are some of the most common artifacts found at archaeological sites in south Alabama. Prehistoric peoples relied on stone tools for a variety of vital activities, such as hunting, food preparation, and woodworking. Not all stone is suitable for making tools, and suitable stone is relatively rare in south Alabama. Three key types of stone were commonly used in the manufacture of prehistoric stone tools in south Alabama: (1) Tallahatta Sandstone (found in the southwest and south-central regions); (2) Tallahatta Chert (found in the southwest); and, (3) Ocala Chert (found in the southeast). Prehistoric peoples looked for what we call knappable stone. Tallahatta Sandstone, Tallahatta Chert, and Ocala Chert are considerably different from each other, but each possesses the basic qualities of stone suitable for making tools. Clear evidence of this is seen in the high density of prehistoric sites and the amount of flaking debris and manufacture rejects found where these materials are available. Researchers investigating prehistoric life in south Alabama are seeking to understand how people used their stone tool technology to adapt to the natural and social environment of their time. Because the occurrence of knappable stone in south Alabama is localized, prehistoric peoples had the choice of either staying near a lithic source or designing their tools to meet their needs when away from these sources and without an easy opportunity to replace stone tools. In this study, several strategies were used to locate prehistorically exploited sources of knappable stone. The first was the identification of previously recorded quarry sites in south Alabama. The second strategy was to work with local professionals and landowners who are familiar with the landscapes in counties where geologic outcrops are known to occur. Our third step was to examine published geologic maps and soils surveys to identify areas where outcrops are likely to occur. Though these flakes of stone are small and do not appear special, they resulted from the manufacture of stone tools and are an important part of the intriguing puzzle of Alabama prehistory. This site offers integrated sedimentological, petrographic, geochemical, and archaeological data on the three key lithic types in south Alabama: (1) Tallahatta Sandstone (southwest Alabama); (2) Tallahatta Chert (southwest Alabama) and (3) Ocala Chert (southeast Alabama). Geochemical data was collected using an electron microprobe on select thin-section samples of material from different quarry sites. Dr. Philip Carr determined prehistoric uses of each lithic material and studied how various quarry sites were exploited. 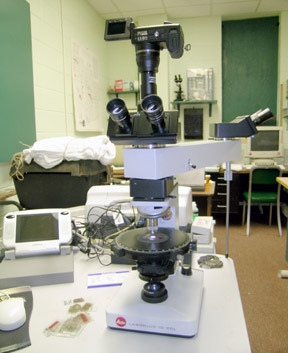 Dr. Douglas Haywick determined geological characteristics of many specimens from each site using thin-section and cathodoluminescence petrography. This analysis may in the future allow lithic artifacts to be linked back to specific outcrops of stone. We hope that our results will aid everyone who has an interest in the rich cultural and geological heritage of Alabama. This site should be particularly useful for learning how prehistoric peoples adapted to their environment with stone tools and will aid visitors to better interpret and appreciate lithic materials found in south Alabama. We thank the Alabama Historical Commission, in particular, Dr. Thomas Maher, for funding this study. We also appreciate the enthusiastic work of undergraduate students John Bongino, Marcus Miller and Leslie Hiles. They were largely responsible for the new field work and lab work featured on these web pages. Dr. Michael Bersch at the University of Alabama helped us with the geochemistry of the lithic materials. Dr. Greg Waselkov (University of South Alabama) provided very helpful comments about our web content. Lastly, we acknowledge the dedicated work of Sarah Mattics in the development of these pages. Without her participation, they would not have happened.